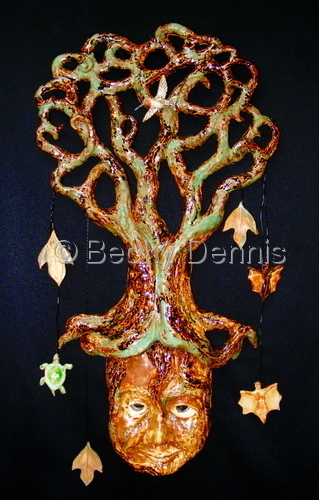 Hand created CLAY sculptures and wallhangings by Mississippi Gulf Coast Artist, Becky Dennis. This is a very Power-Full Clay Piece. 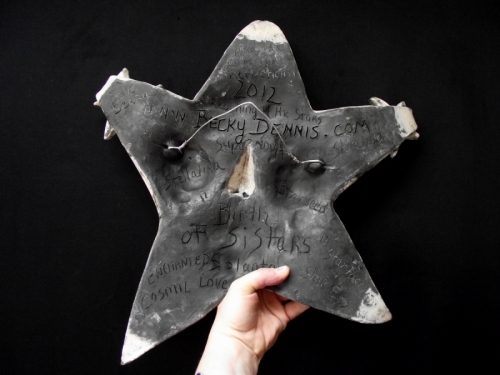 The original idea for this Inspired Sculpture came to me in a powerfully lucid dream prior to hurricane Katrina. In the dream, I was swimming peacefully when a giant sea Turtle approached me and nudged me. I felt afraid and he told me in my mind "Do not fear, for we are ONE." 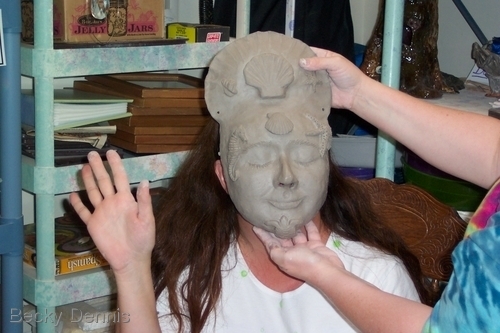 The following day when I was in the studio working on a sea turtle sculpture in clay, the realization came to me that I could create a human face emerging out of the turtle shell. This illustrated the concept that "We are One." And so it became an outward expression in the days that followed. Katrina hit soon after the bisque firing and I was not able to complete the piece until nearly a year later. Here is the image of the original piece for you to enjoy. Keep in mind that the actual clay Art Piece has a Life and Energy that a picture simply does NOT possess. Museum award winning raku clay sculpture.The Juror at the Ohr O'Keefe museum of Art purchased number two piece for his own collection. I own the original and am unwilling to sell it. This piece has a powerfully radiant and LOVING Energy. Willing to recreate a similar commissioned piece with a 150 dollar deposit.Please allow 8 weeks for completion. Keep in heart/mind that each piece will be uniquely different. The glaze and firing in the RAKU process can not be controlled as much as stoneware firings. In my Life, I have been blessed with the GIft of Dreams and Visions. After being diagnosed with cancer in 2011, I found my Life turned upside down. My perception on everything shifted dramatically. It took the Love of Family and Friends to help me heal and move forward on the journey. 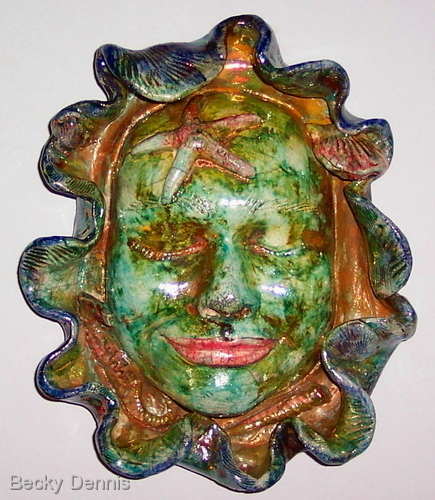 This Piece came forth when my Sistar Friend was visiting and we both played in clay in the studio together. It represents my LOVE of communication and belief in the power of LOVE to heal our bodies, our minds, our hearts, our Spirits. Most people that know me well, know that I am highly Intuitive. After surviving the harsh fires of Raku, this Piece cracked and broke on the wing as I was cleaning it! SO, I will be keeping it, but I would consider creating a similar Piece if someone asked. See the "pyramid" and the "eye" on the top? 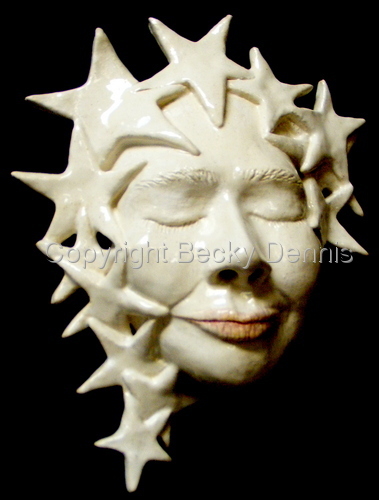 My Love of the strength of the SUN is expressed in this Piece that was inSpired by SunFlowers in the Garden. Ironically, this Piece was inside my head, bouncing around, for a very long time, until I finally decided that I would lose my Mind if I did not create it and give it Expression in the world of form. I posted it on facebook and a Friend that lives in New Jersey said that Ursa would be a great name since it has a Bear Claw in the hair. I decided that it needed more than that and added the VISION part. It was made at least a month before hurricane Sandy that has so tragically devasted the northeast coast. Notice the Sea Turtle in the water and there are two EYES. There were three, but as I was cleaning the piece, one end broke off. And there is a Full Moon near her head and a Tear coming forth from her eye. I have decided to offer a "series" of these Pieces. 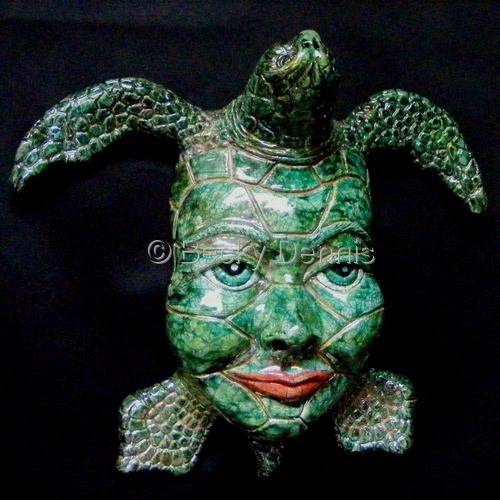 Raku clay sculpture face mask. SOLD at Festival International. Other smaller pieces available. My Love of SUN Images goes back to childhood. This One came forth directly from my heArt. Fired in RAKU with wonderful small and large crackles. The colors are brilliantly captured to bring Light on even the darkest of days. 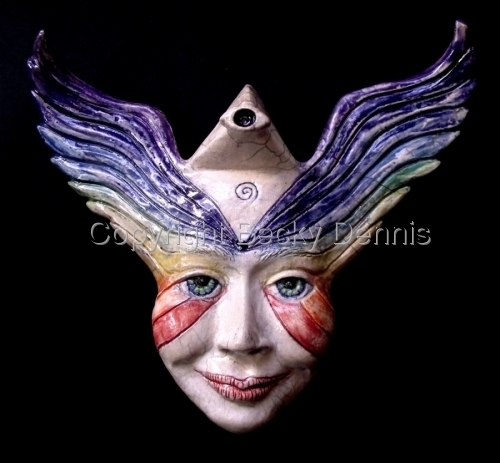 As a clay artist, it is wildly disturbing to have an Idea in the Mind and not be able to Create it and give Birth to IT. The Idea for this one floated around for a long time and was finally released recently. This Hand sculpted Face Mask was actually inSpired by my Friends and Fans on Facebook. 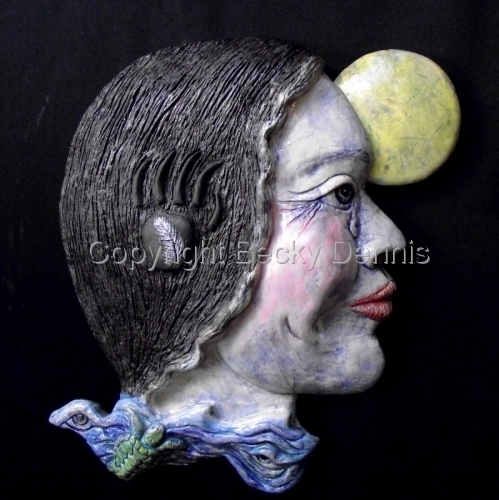 Please See my Art in Clay by Becky Dennis fan page and You can participate in the dialogue. Eye have always been a rather open Minded Woman and Feel it is critical to find a way to connect with Other Beings and to find common ground. There were many In-Sights associated with this Raku Face Mask. 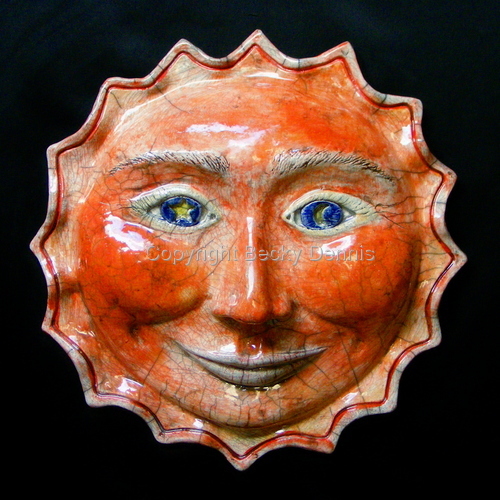 Sculptural Raku SUN wallhanging. SOLD May 08 in Lafayette, LA. The customer that received this piece has a birthday on May 7th, two days before mine. 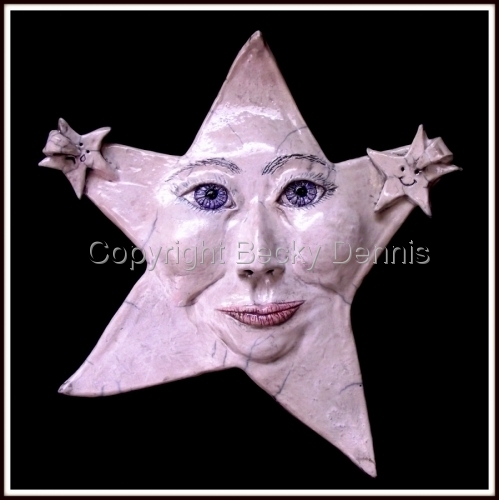 Notice the star and moon in each eye?Sometimes, I am a bit attached to pieces and that was the case with this one. I do trust it is shining LOVE in a good home now. Willing to accept a commission to re-create a similar piece, however each Piece is uniquely created and original. That price will be negotiated since it depends on several variables including size, firing method, (raku is more risky and therefore more money) and design. Also, the "RED" glaze is a much more expensive chemical glaze. 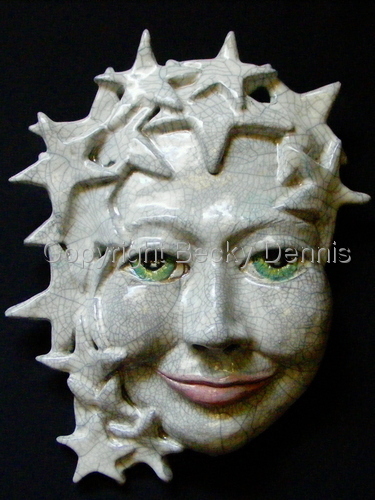 Feel free to contact me if you are interested in your own SUN scupture. Also, please look at this piece under the magnifier and you will see more of the "crackle" detail that is ONLY present in Raku firing method. 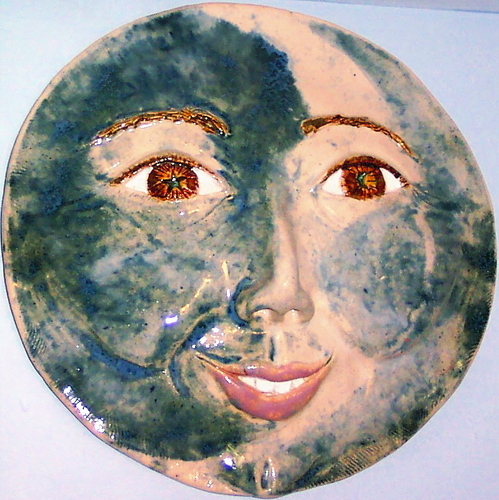 My Love of the Moon is reflected in this very Feminine, Raku fired Clay Wallhanging. In the raku firing method, it is desirable to see large and small crackles in a Piece. 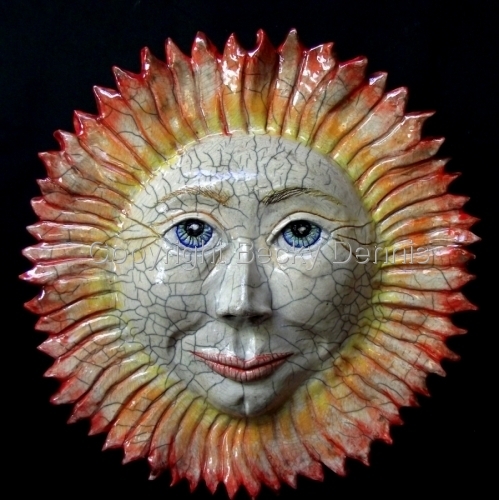 Many Clay Artists are not successful in removing larger Pieces from the Kiln. The Fires and reduction process were kind and the Piece survived. We can ALL grow and thrive when we experience the Fullness of unconditional LOVE. May You feel Loved and supported on the journey. 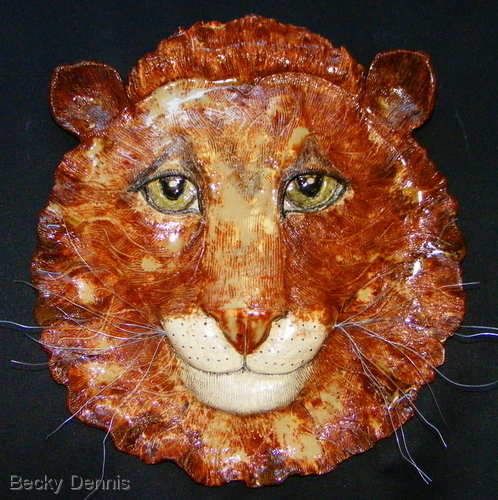 New stoneware hand-sculpted Lion's Head is the third in a series of LIONS that I am sculpting creatively in Clay. 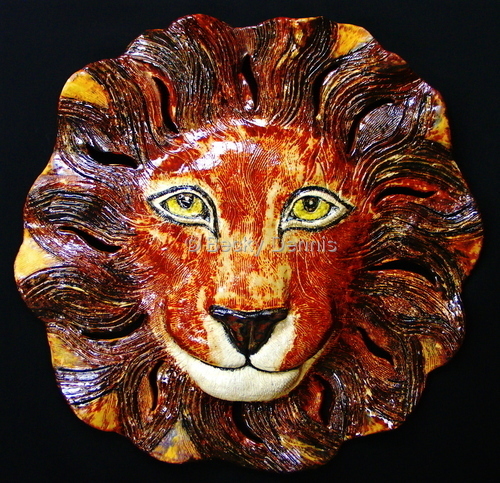 The glazes on this large wall-hanging flow beautifully to reflect the beauty and power of LION. 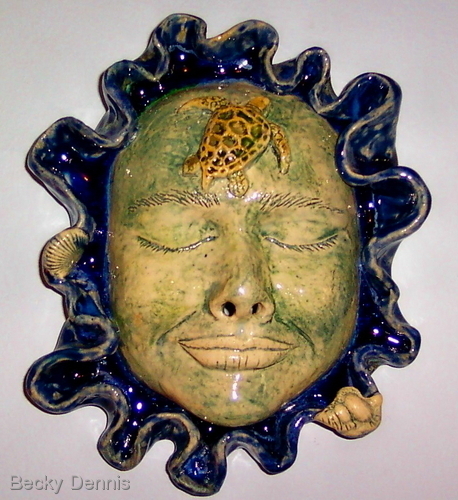 Stoneware, hand-sculpted,clay sea Turtle merging with human face. This Piece is from 2008 and is from the "Emergence" series that began in 2005, just prior to hurricane Katrina. Initially, the idea for this sculptural series came to me in a dream prior to hurricane katrina's visitation. In it, I was peacefully swimming and a large Turtle suddenly swam up to me, started me and nudged me to pay attention. Then, I was told to have no Fear for we are ONE. I continue to experiment with new glazes and twists on the original idea. One of the first pieces received the Juror's choice award at the OHR Rising museuem exhibition. One of my favorite pass times is literally Floating in Water and Looking up at the Clouds. It occured to me recently that I am not separate from All that Is. This Piece literally was in my "head" for a year before I finally allowed it to come forth in Clay. It is fired in Raku and has lovely crackles and expresses my Love of Nature, including the Clouds. 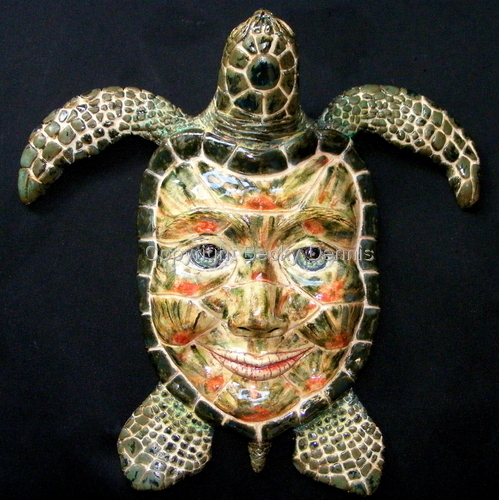 Stoneware, hand-sculpted,clay sea Turtle merging with human face. This Piece is from 2008 and is from the "Emergence" series that began in 2005, just prior to hurricane Katrina. There are mirrors in the EYES, which causes Your Image to became part of the sculpture for a moment in time. Initially, the idea for this sculptural series came to me in a dream prior to hurricane katrina's visitation. In it, I was peacefully swimming and a large Turtle suddenly swam up to me, started me and nudged me to pay attention. Then, I was told to have no Fear for we are ONE. I continue to experiment with new glazes and twists on the original idea. One of the first pieces received the Juror's choice award at the OHR Rising museuem exhibition. 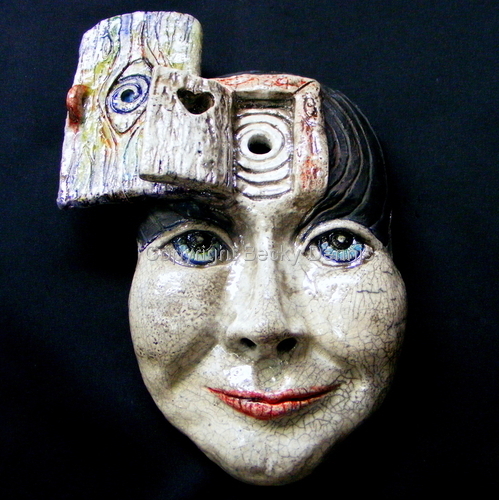 Hand sculpted clay and mixed media wallhanging in two pieces with mirrors in the eyes. Trees are so much a part of my consciousness and awareness that it felt important to represent that through my art. It is called Deep Roots because I feel, as an avid gardener, that it is critical that we tend to the roots of things in life. If we do not water the roots, well, the plant, tree, relationship, art,career, etc. will wither and die. So, I choose to water the roots of those things that are of immense value to me in life, especially relationships with family and friends. The pieces hanging from the tree are also significant and symbolic. Feel Free to contact me. EnJoy! SOLD, but creating more. There is enough is my mantra these days! 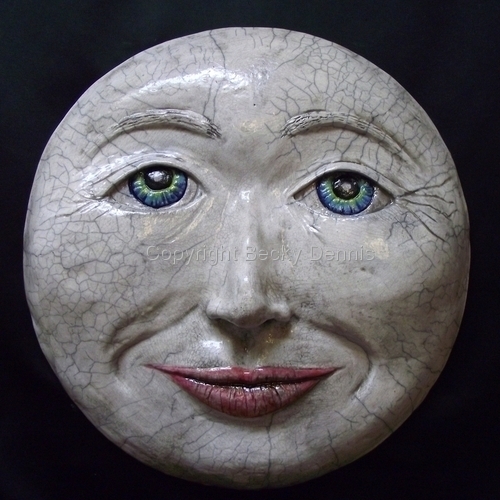 This piece was actually inSpired by the face of a lovely young woman and I decided to create a crescent Moon that I knew would be fired in raku. The message on the back simply says: "Love All." Raku clay mask with a quietly peaceful expression. Emphasizing the value of looking WITHIN for truth and answers. So often we are caught up in the illusion of Life. Until we look within, we will often go without. May you find Peace on the Journey. Remember, we are Stardust. Stoneware clay sculpted wallhanging. Interestingly, when I initially created this piece it was meant to be a SUN, but the rays broke off and to "go with the flow" I ended up allowing it to be a Moon... It actually says "Dancing Moon" on the back,but you can see where it was initially named Dancing Sun. It just felt like a Blue Moon to me. This piece is part of my personal collection and was one of the very first pieces that I created after we bought our home. 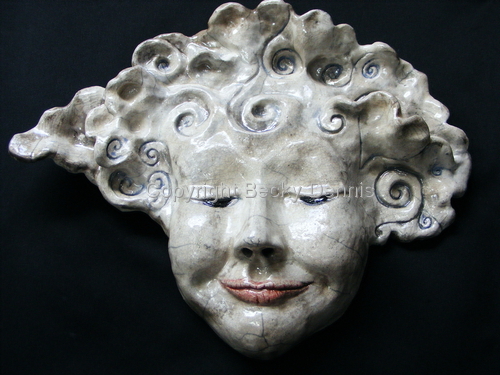 Stoneware sculpted face mask. These Pieces are inSpired by my Love of Sky watching and Star gazing. They also represent the need to Look within our Heart, Mind and Soul for answers and Guidance. Hand sculpted face mask pit fired. InSpired by my soul Friend Queen Uokes Ra. This Piece can not be duplicated and it part of my own collection of Art Pieces. The shading of Dark and Light was very amazing and soft and gentle. 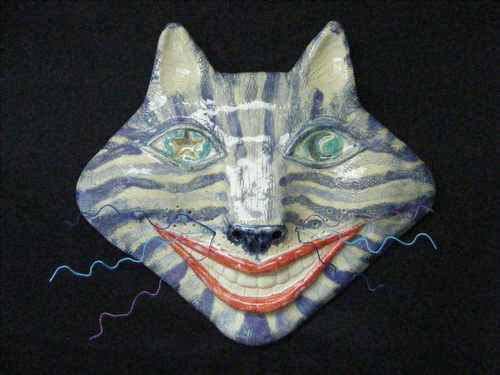 Stoneware cat wallhanging a unique personality. Glazed in beautiful glazes mixed with chemicals. Whiskers are Wire and add a little something extra to the sculpture. SOLD Nov.2008. 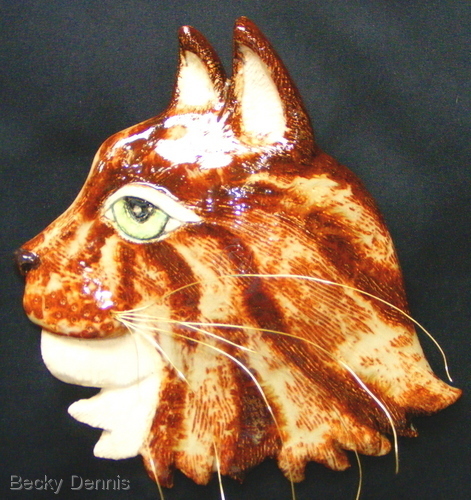 Stoneware cat wallhanging in a beautiful white with sweet whiskers and real stained Glass in the eye. Seems to be smiling and looking for the human who will be it's caretaker. Cats choose Us, not the other way around! 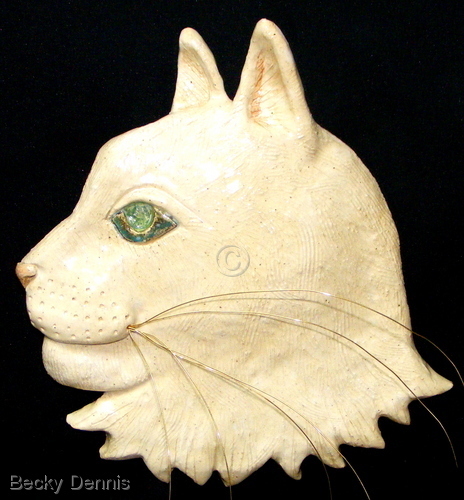 My absolute LOVE of Cat shines thru this hand sculpted wall adornment. 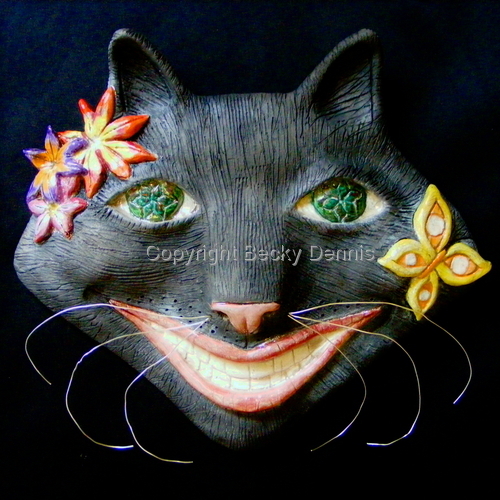 Whimsical, hand created raku, Happy, cheshire clay cat face mask with flowers and butterfly. This piece combines two of my favorite things.... cats and flowers! Sold,but I Am recreating similar pieces that will be available. 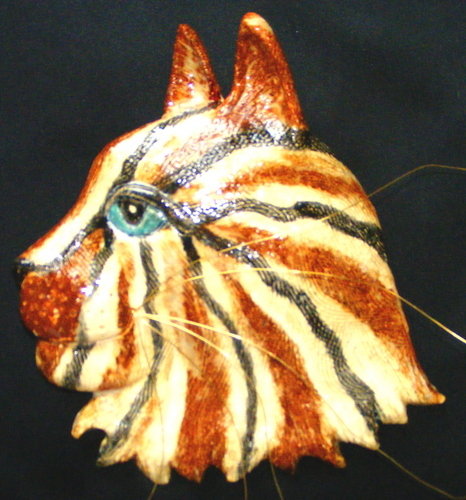 Stoneware cat wallhanging with wire whiskers flowing outward. This tabby is still looking for it's Home. Call me if you know who it belongs with! 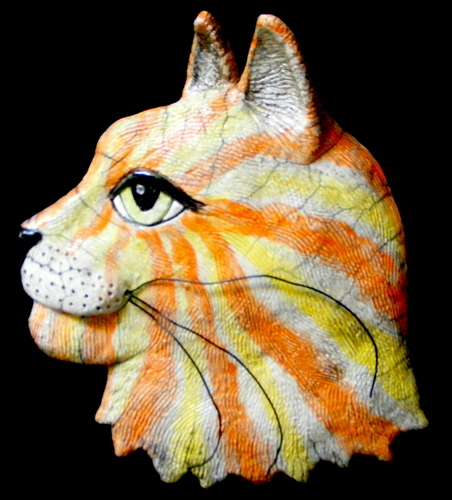 Raku cat wallhanging. Available May 08. 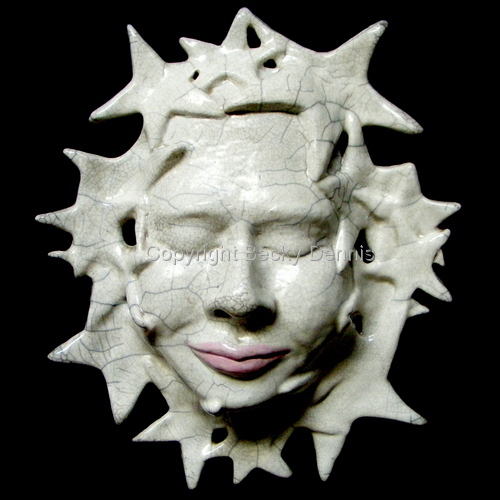 Stoneware clay sculpture wallhanging. Sold. Can recreate "Similar" piece. 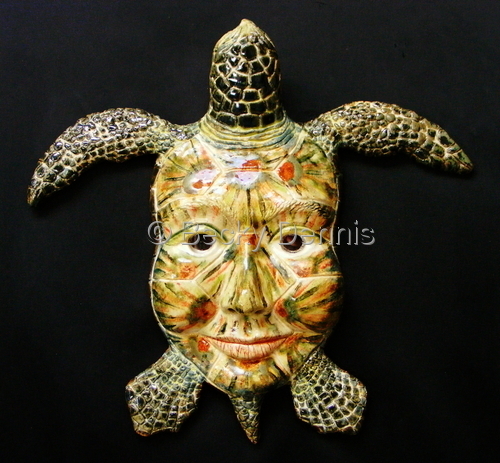 This is a very early piece that I now see was the beginning of my awareness of the importance of turtle to my heart, mind and soul. 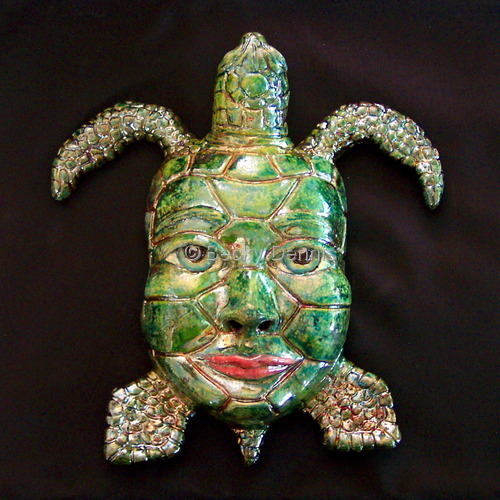 My awareness of the Spirit of Turtle has grown over the past ten years and my creative expression using the image of turtle is continually transforming into new clay creations. Raku clay sculpture. This award winning piece sold at the OHR RISING exhibition in 2006. In fact, the Juror of the show purchased it for his own collection. 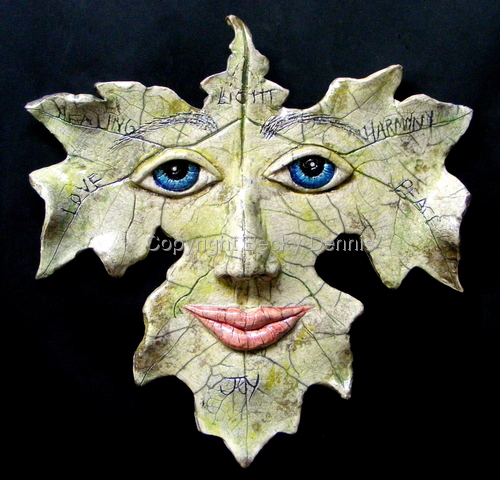 This is a very early piece that I created when I was beginning to explore creating face masks in clay. It represents the interconnectedness of Life. Fired in raku and currently available to purchase from my personal collection. I am willing to release it to the "right" person who feels a connection with it. Remember Art is a safe investment that can also give many years of Joy as it appreciates in value. 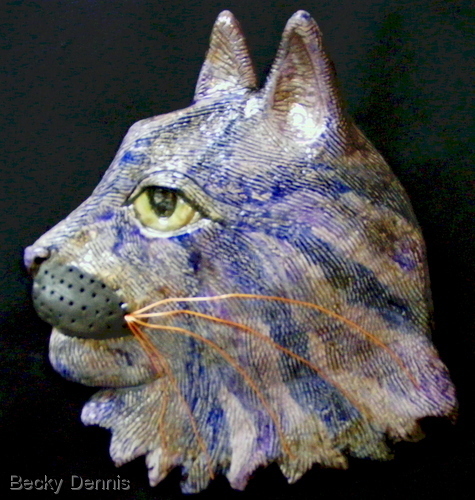 Raku cat wallhanging. This fellow represents my concept of the purrfect purple cat with flowing whiskers. Sold Nov. 2008. More on the way... but no two are exactly alike! Just like cats and just like their human companions! SOLD. 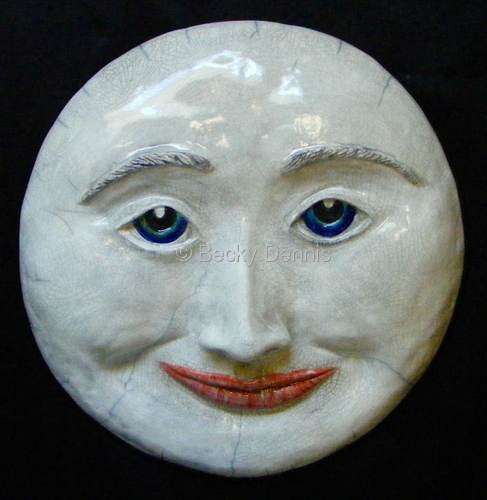 This hand sculpted raku full moon face has a sweet expression that is very soft and perhaps a bit sad. It was, however a JOY to create and a lovely gentleman purchased it immediately after it was completed. The raku crackle was exceptionally good and I am currently working on another unique MOON in the studio now. SOLD. 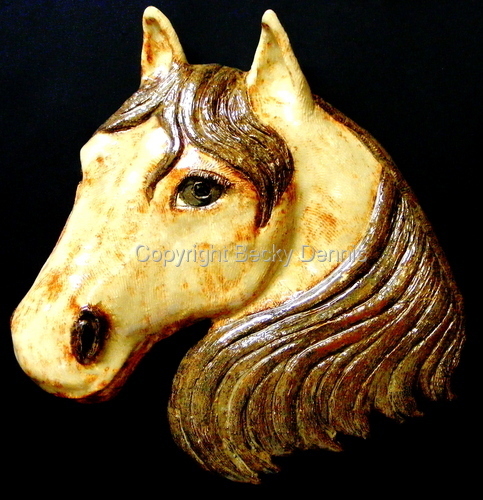 Paper clay stoneware sculpture Horse head sculpture in golden warm glazes. 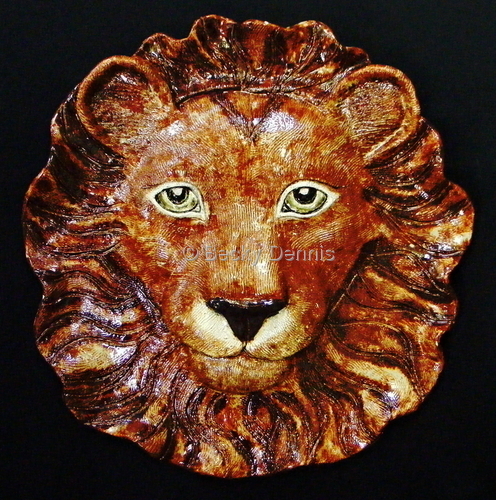 This hand sculpted Lion face with whiskers was created with absolute JOY for Jaye Dee, a loyal customer. I simply created (Took a month from start to finish) and she showed up at the festival the day after it was completed. It was Love at first sight! Sold to a beautiful Woman.This is another creative Raku Leaf Face wallhanging with the message on the back that says: "Love grows in my Garden." There are also words on the front including Light, Healing, Harmony, Love, Peace and Joy. These are certainly things that we can aspire to Be and Do. Life is about blending the Being and the Doing.It is a journey of discovery. Messages come in many forms and this expresses my Love and Reverance for the Earth's Gifts. SOLD.Thank You! 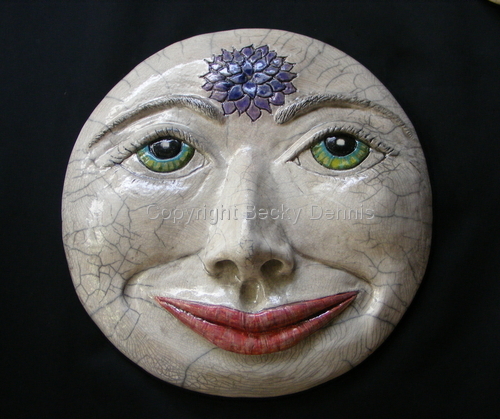 Hand sculpted clay FULL MOON FACE with beautifully expressive eyes and purple lotus flower on forehead,representing the emergence of Spring after the long sleep of Winter. Also the InSight of WISDOM that comes with the experience of life lessons. There are lovely full red lips and a perfectly shaped nose. Fortunately, it has excellent small and large Crackle on the scultpure. I have little control over this and "hope" for the best during the firing process. It was fired outdoors using the Japanese RAKU firing process with strong reduction. Message on the back says: "May you Blissfully Dance under the Light of the Radiant and Healing Moon." Measures 15 inches. 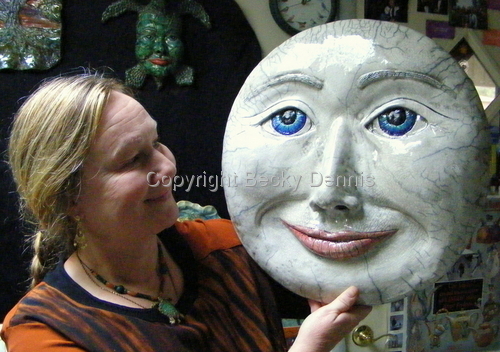 This is a recent photo of a Full Moon sculpture that was sold. 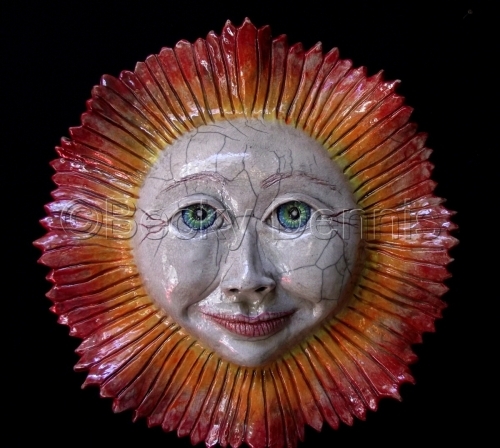 Close-up of EYE in "Singing Her Praises"
Hand sculpted clay sculptural wallhanging of lovely clay Moon fired in Raku. 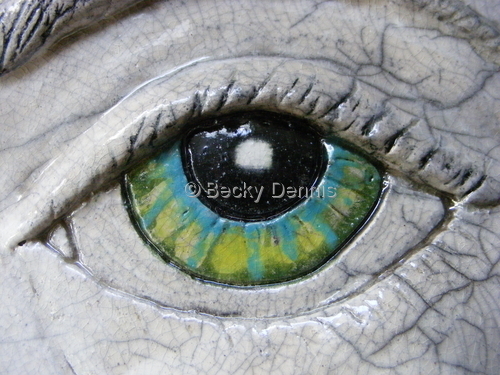 This is a close-up image of one of the Eyes in the piece. 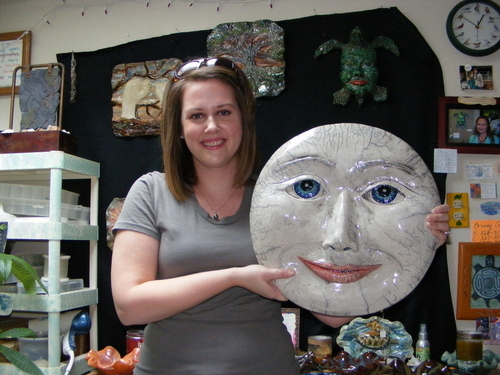 Sarah drove all the way over from Lafayette, LA to pick up this raku clay full moon sculpture for her Mom for Christmas. Hand sculpted clay Wolf howling at full Moon fired outdoors on second firing using the Raku firing process. There are very nice small crackles and larger crackles on the Piece. Wire whiskers were added, but can be removed if Buyer prefers. 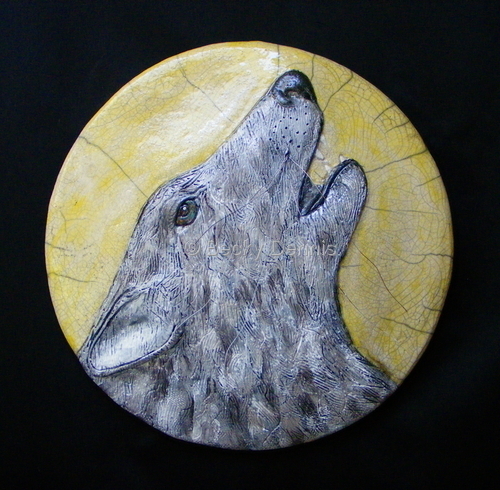 The Message on the back says: " May you find your Voice and your Power... May you Howl at the Moon with Wild Abandon! May you RUN with the WOLVES and be Free." Since I play diligently to pay attention to the DETAILS in Life, even though I am a bit of a Big Picture Person, the back of the Clay Art Piece is as important as the front. On this One, You can see ALL of the many "names" of this Piece. My Friends on facebook, who have been so very supportive and encouraging as I have moved thru the challenge of cancer, helped me NAME this One. Hand sculpted and carved clay wallhanging. Inspired by my love of Lions and all that they represent.It appears to be a merging of Lion and Sun into a sculpture that makes a dynamic impact with a hint of mischievousness. SOLD. 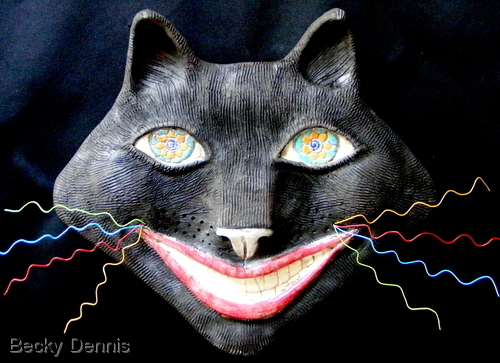 Hand sculpted raku cheshire cat face mask with crazy whiskers and brilliant flower eyes of fire. 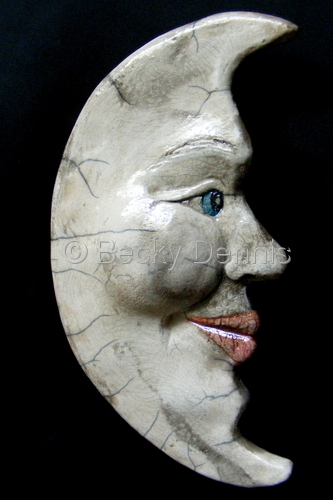 This radiant Face of the Moon was just completed after I was out of the studio for over six weeks due to a major injury. 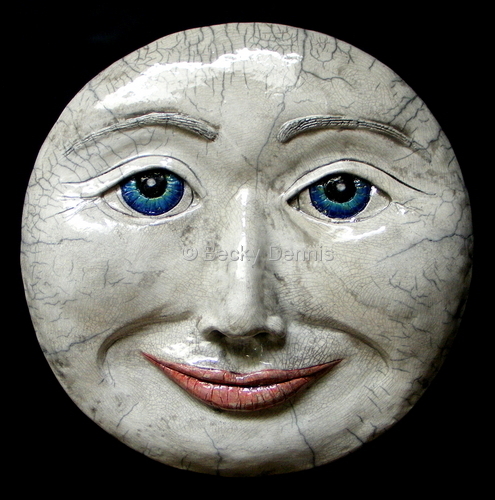 It gave me such JOY to sculpt this beautiful face and to finally complete it. When firing in raku, it is very desirable to have large and small crackles and this piece fortunately does. The eyes are deep and compassionate. One summer I offered a clay mask-making "playshop" in which each of the five women involved created an original mask of their face. 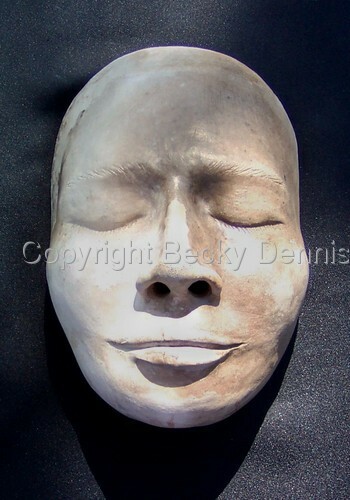 I cast each participant's face with plaster gauze, then rolled out a slab of clay and pressed it into the mold. After lunch, we designed and decorated each mask. The face masks were allowed to dry and I bisque fired them. Later, the class reassembled and we hand glazed each mask and then fired it using the RAKU method. Each person was thrilled with a face mask they could treasure for a lifetime and one day look back and say "I looked like THAT when I was younger!" We had a tremendously enriching shared Experience during those classes. I offered the class for 350 dollars each and that included the supplies and firing. Contact me for current prices.